Microsoft's Kinect is calibrated through the use of a little rectangular man whose face will melt even the coldest heart. From the mouse to the touchscreen, it seems like every type of controller needs to be calibrated from time to time for perfect accuracy. Microsoft's Kinect will be no different, but technological calibration has never been this adorable. Kinect is reportedly calibrated through the use of a cute mascot. 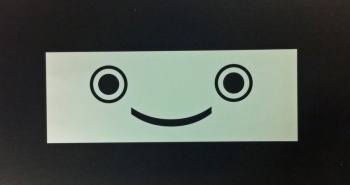 Meet smiley rectangle-face Kinect calibration man, whom doesn't have an official name, but I refer to him as Kenny. Kenny enjoys long walks on the beach, watching TV, and ensuring that your Kinect experience is as accurate as possible. Kenny's face is plastered on a calibration card that's included in the box of various Kinect titles. If you feel that your movements aren't being read accurately while playing Kinect, you can free Kenny from his plastic prison and use him to reset the sensor. This is apparently done by moving Kenny's face around so that on-screen glasses fit on his face in various positions and at various distances from the Kinect camera. Through this method, Kinect can figure out the length of your room and maybe even how tidy it is. Now stare into Kenny Kinect's eyes and profess your undying love for Microsoft lest he consume your soul.